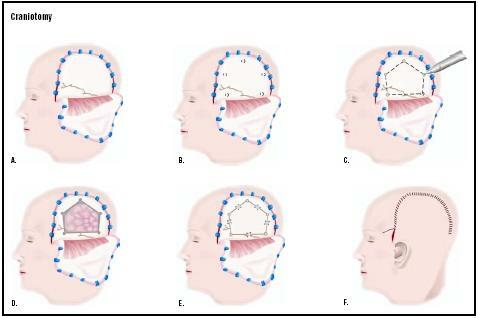 A craniotomy is a procedure to remove a lesion in the brain through an opening in the skull (cranium). A craniotomy is a type of brain surgery. It is the most commonly performed surgery for brain tumor removal . It also may be done to remove a blood clot (hematoma), to control hemorrhage from a weak, leaking blood vessel (cerebral aneurysm), to repair arteriovenous malformations (abnormal connections of blood vessels), to drain a brain abscess, to relieve pressure inside the skull, to perform a biopsy, or to inspect the brain. Because craniotomy is a procedure that is utilized for several conditions and diseases, statistical information for the procedure itself is not available. However, because craniotomy is most commonly performed to remove a brain tumor, statistics concerning this condition are given. Approximately 90% of primary brain cancers occur in adults, more commonly in males between 55 and 65 years of age. Tumors in children peak between the ages of three and 12. Brain tumors are presently the most common cancer in children (four out of 100,000). There are two methods commonly utilized by surgeons to open the skull. Either an incision is made at the nape of the neck around the bone at the back (occipital bone) or a curving incision is made in front of the ear that arches above the eye. The incision penetrates as far as the thin membrane covering the skull bone. During skin incision the surgeon must seal off many small blood vessels because the scalp has a rich blood supply. The scalp tissue is then folded back to expose the bone. Using a high-speed drill, the surgeon drills a pattern of holes through the cranium (skull) and uses a fine wire saw to connect the holes until a segment of bone (bone flap) can be removed. This gives the surgeon access to the inside of the skill and allows him to proceed with surgery inside the brain. After removal of the internal brain lesion or other procedure is completed, the bone is replaced and secured into position with soft wire. Membranes, muscle, and skin are sutured into position. If the lesion is an aneurysm, the affected artery is sealed at the leak. If there is a tumor, as much of it as possible is resected (removed). For arteriovenous malformations, the abnormality is clipped and the repair redirects the blood flow to normal vessels. Before surgery the patient may be given medication to ease anxiety and to decrease the risk of seizures, swelling, and infection after surgery. Blood thinners (Coumadin, heparin, aspirin ) and nonsteroidal anti-inflammatory drugs (ibuprofen, Motrin, Advil, aspirin, Naprosyn, Daypro) have been correlated with an increase in blood clot formation after surgery. These medications must be discontinued at least seven days before the surgery to reverse any blood thinning effects. Additionally, the surgeon will order routine or special laboratory tests as needed. The patient should not eat or drink after midnight the day of surgery. The patient's scalp is shaved in the operating room just before the surgery begins. Craniotomy is a major surgical procedure performed under general anesthesia. Immediately after surgery, the pa tient's pupil reactions are tested, mental status is assessed after anesthesia, and movement of the limbs (arms/legs) is evaluated. Shortly after surgery, breathing exercises are started to clear the lungs. Typically, after surgery patients are given medications to control pain, swelling, and seizures. Codeine may be prescribed to relive headache. Special leg stockings are used to prevent blood clot formation after surgery. Patients can usually get out of bed in about a day after surgery and usually are hospitalized for five to 14 days after surgery. The bandages on the skull are be removed and replaced regularly. The sutures closing the scalp are removed by the surgeon, but the soft wires used to reattach the portion of the skull that was removed are permanent and require no further attention. Patients should keep the scalp dry until the sutures are removed. If required (depending on area of brain involved), occupational therapists and physical therapist assess the patient's status postoperatively and help the patient improve strength, daily living skills and capabilities, and speech. Full recovery may take up to two months, since it is common for patients to feel fatigued for up to eight weeks after surgery. The surgeon will discuss potential risks associated with the procedure. Neurosurgical procedures may result in bleeding, blood clots, retention of fluid causing swelling (edema), or unintended injury to normal nerve tissues. Some patients may develop infections. Damage to normal brain tissue may cause damage to an area and subsequent loss of brain function. Loss of function in specific areas can cause memory impairment. Some other examples of potential damage that may result from this procedure include deafness, double vision, numbness, paralysis, blindness, or loss of the sense of smell. Normal results depend on the cause for surgery and the patient's overall health status and age. If the operation was successful and uncomplicated recovery is quick, since there is a rich blood supply to the area. Recovery could take up to eight weeks, but patients are usually fully functioning in less time. There is no information about the rates of diseases and death specifically related to craniotomy. The operation is performed as a neurosurgical intervention for several different diseases and conditions. There are no alternative treatments if a neurosurgeon deems this procedure as necessary. Connolly, E. Sanders, ed. Fundamentals of Operative Techniques in Neurosurgery. New York: Thieme Medical Publishers, 2002. Greenberg, Mark S. Handbook of Neurosurgery. 5th ed. New York: Thieme Medical Publishers, 2000. Miller, R. Anesthesia. 5th ed. Philadelphia, PA: Churchill Livingstone, 2000. Gebel, J. M., and W. J. Powers. "Emergency Craniotomy for Intracerebral Hemorrhage: When Doesn't It Help and Does It Ever Help?" Neurology 58 (May 14, 2002): 1325-1326. Mamminen, P., and T. K. Tan. "Postoperative Nausea and Vomiting After Craniotomy for Tumor Surgery: A Comparison Between Awake Craniotomy and General Anesthesia." Journal of Clinical Anesthesia 14 (June 2002): 279-283. Osguthorpe, J. D., and S. Patel, eds. "Skull Base Tumor Surgery." Otolaryngologic Clinics of North America 34 (December 2001). Rabinstein, A. A., J. L. Atkinson, and E. F. M. Wijdicks. "Emergency Craniotomy in Patients Worsening Due to Expanded Cerebral Hematoma: To What Purpose?" Neurology 58 (May 14, 2002): 1367-1372. American Association of Neurological Surgeons. 5550 Meadowbrook Drive, Rolling Meadows, IL 60008. (888) 566-AANS (2267). Fax: (847) 378-0600. E-mail: info@aans. org. http://www.neurosurgery.org/aans/index.asp . The procedure is performed in a hospital with a neurosurgery department and an intensive care unit . The procedure is performed by a board certified neurosurgeon, who has completed two years of general surgery training and five years of neurosurgical training. What kinds of tests and preparation are necessary before surgery? How often is normal brain tissue damaged during this type of surgery? What complications may result from this type of surgery? How many of these procedures have you done in the past year? I had an Craniotomy (clipping an Aneurysm) on July 18/07. Everything seems to be fine except some swelling where the incision is...wondering if this is normal. My husband just had a craniotomy to clip an aneurys four days ago. Everything went well except he's had severe nausea since the surgery. The doctors have tried every sort of nausea medication available and he still nauseated. Has anyone else experienced this and how long did the nausea last? My daughter had a craniotomy at 6 months old to repair a depressed skull fracture caused during birth. She has had so many developmental delays, headaches and now that she's 13 she having more leg pain, arm pain, severe pain in the neck which causes the headaches or vice versa. She has also experienced seizures. She has been through and still going through so mcuh at her tender age. The sad part is that the doctor's cannot give a proper diagnosis ans it sadden's me that after all these years her doctor's don't communicate with eachother to help us. Well maybe two of them her pediatrician and psyiatrist. I underwent a craniotomy on Nov. 28, 2006, for a huge "balloon" type of aneurysm. The neurosurgeons found it so complex that they not only clipped it, but burst it, sucked out any blood that went into my brain when it burst, cut my main jaw muscle, and rerouted some veins and capillaries. The operation was successful in the technical aspects, and I seemed to recover normally to the doctors and the surgeons, but I have had terrible fatigue, nausea, and constant headaches since the operation. Also, since the craniotomy, I told the neurosurgeons and many doctors about the side effects, but they seemed to have no answers for me, as July, 2007, CT scans of my head and neck showed some changs, but nothing too bad. However, I had another CT scan of my brain and neck in Feb. 200i which showed some intracranial hemorraghing which has stabilized now, but I still continue to have constant fatigue, nausea, and headaches that are preventing me from working again and from leading a "normal" life, as these side effects occur almost daily. I am on a strong anti-nausea medication called Zofran, but it doesn't seem to help THAT much, and doesn't help at all with the fatigue. I also am taking Klonopin and Trileptal, but the headaches continue. They are NOT migraine headaches, just constant headaches on the side of the head where the craniotomy was and where the main jaw muscle was cut. Most likely the headaches and nausea contribute to the fatigue.....is that correct? I am writing this to you on May 21, 2008, so it has been one and a half years since my craniotomy and the hemorraging occurred between July, 2007, and Feb. 2008 when I had two brain and neck CT scans that showed the intracranial hemorraghing, but that seems to have stopped. Will the fatigue, headaches, and nausea continue? Is there something that can be done to help me so I can function better? I do try to exercise walk as much as possible, but when I do, I really need to rest and sometimes sleep for hours afterward. Walking was my exercise of choice since 1987 so I am dismayed that it is so hard for me to do now without feeling great, as before the craniotomy, but worse on most of the days that I take long walks with my dogs in an "off-leash" park so I can swing my arms and really walk without having to stop many times as the dogs stop to sniff and "do their stuff", so to say! Thank you in advance for any advice that you can give to me. I will be more than willing to try ANYTHING to help me to improve my functioning, as I was always an active woman. I taught junior high school for 30 years, loved it, and never was as tired as I am now, even when I had little sleep on many days correcting papers, taking care of my child, etc. Please, please help me! I will try ANYTHING you suggest to help myself get better. THIS IS GOOD INFORMATION. IT IS VERY HELPFUL TO UNDERSTAD THE CONCEPT OF CRAINOTOMY. i had a craniotomy last april 6, 2010.I can say theat the operation is quit successfull. but its been 3weeks since the operation done. and still Im having a fever not more than 38.5 deg.celcius.Is normal? what will I do? i had a crainiotomy eleven months ago.i almost died. it was a bad bleed at the base of the skull.18 days in icu. i had bad nausea headach vision and balence problems.i couldent drive for 6 months.things i am much better now but i will never be the same.at my current rate of recovery i hope to be 100% in another 12-15 months.onley advice i have is to get off the pain med's ASAP. watch your diet. stay activ.and dont expect the doctors to make the side efects go away. on march 2nd 2010 7.30 ammet with an accident i was on a two wheeler got injured and underwent craniotomy sub dural hematoma was diagnosed on the right side skull a g incision has been made the bone had been removed due to bone got damaged in the accident which cant be placed. the doctor convinced me that we can go through a plastic surgery in place of the broken bone till date i have no problems i am leading a normal life without having the skull bone only the scalp has been stapled with the other part. i always used to wear cap if anybody look at me without a cap they used to get aback after watching the head dent at right side above the ear. there is nothing to worry the doctor once told if the plastic surgery is underwent there are chances of having a blood clot while doing surgery and in future too. now i am leading my life without a skull bone above the ear in the right side. i had a craniotomy over my frontal lobe 5 years ago for a subdural hematoma. i was in a coma for some time and in icu for 2 weeks. my hspitalization was 5 week. I left thinking every thing would be the same. two seizure episodes and hospitalization within 8 months i began to realize things were not going to be the same. It does involve massive lifestyle changes, not hard as i am aware of the skull incision all the time. even now i am realizing i still have head pain, i think most of the time i got used to it but have noticed an increase lately. The injury has affected my work, loss of acuity, confusion and forgetfulness. Do not have the attention to detail i had.this is what i am learning to accept now. YOU HAVE TO TAKE BABY STEPS. seizures can cause a fall and a rebleed. My brother had a blood clot removed from his right frontal lobe part of his brain, the surgery went well but he has severe headaches. He is also a Juvinile Diabetic, is the normal or is there still something wrong, it has been 2 weeks since the surgery. i want to know whats kind of antibiotic use for cranyotomi and how long to use this? I have a 14mm parietal meningioma and am considering surgery for removal. The headaches that I have with it are constant now and my vision is blurred off and on. I was just wondering if anybody had surgery for removal of this type of meningioma and what the risks are and if it was helpful to symptoms they were having beforehand? After recent crainiotomy I have clicking in right ear. Why? Is swelling about the size of 1/2 orange at the surgical site common? My sister had a meningioma (about 4 cm. )removed in June, 2010. She had a fairly uneventful recovery except that she has had continuous head pain every since. She has been prescribed several different pain medications with no relief. She most recently went was put on Indocin and told she may have hemicranial continuum which doesn't sound very promising. Do you have any suggestions as to what might give some relief. Any help will be greatly appreciated. Hi,i had a craniotomy a year and 5 months ago for a acute subdural hemotomy.It was pretty bad,i had a 1st time seizures and fell and banged my head,i woke up on the floor with the ambulance there,they did a ct scan at the hospital and i had a big bleed,also my brain shifted to the right..they took my to a hospital 2 hours away.I arrived on a sat morning they did the surgery in the afternoon and had to come back on thursday to remove the rest of the blood,i had torn some vessels and they wouldn't clot.I was in the hospital for 3 weeks.Since then i have pain in my head, where the scar is,also a dig dip where they burred one of the holes,still slurred speech,numbness in my arm,dizziness,blurred vision,neck pain and so on.there is not a minute of a day that i do not have pain.They did a ct scan and said everything is good,,i dont think so. Anybody still have the conditions i have for so long? my neurosergeon said i shouldn't be having anymore pain.And this is rediculas without insurance or medicaid..please help..Thanks. i had cran- for aneu- 1/4/2011 everything went well , twas in hosp- for 8 days. My son had a Crainotomy when he was two months old. He had no complications, however he is going on two years old and still does not say any words. He does mumble and laugh. I am just concerned about developmental milestones. He can walk and run just presents no interest in talkng. I have a craniotomy planned for a removal of a colloid cyst. Any suggestions on preparation and recovery? Our daughter 52 and handicapped had a brain tumer removed Dec. 3 on left frontal lope. She only took three weeks of temodar , her blood levels dropped to low and the doctor waited for them to come up but when we went back we were told he could not give anymore chemo because of her blood and there had been to big of a gap up to this time. We will go back to see him next Tues. Her feet have been swelling like edema for about two weeks. Her hands have a tremor periodically. She seems to be weak and is unable to go up two steps into our home without holding on to the wall. She can not walk 50 ft without being out of breath and shaking. SHe is very pale no rosy cheeks and might eat a small saucer of food each meal. Her neurolgist who she has seen for years because she has seizures has recently given her potassium,and a prenatal vitamin. Her tumor was a grade 3, but we were told had feelers.She did take radition about 6 weeks after the surgery before she started chemo. We will see the chemo Dr. again next Tues. What are your thoughts on this. We live in Arkansas and I am wondering if it is to late to take her somewhere else for a second Dr.' s opinion. my frnd had undergone a head surgery 1mth back n now he is suffering from headache daily at da operation side and there is a nose bleeding..
i would like to know y the paining is still there to him is there is any risk to him..
@Rich - I had a craniotomy to remove a colloid cyst 10/1/09. My only suggestions are (1) plan to take notes after the surgery, short term memory issues are common w/the colloid cyst removal and (2) make sure you get enough rest after the surgery - 21 months post surgery and I am still ready for a nap at noon. I went back to work 18 days after surgery (in accounting) and wish I'd taken a little more time off. If you have a facebook account, there is a colloid cyst group on there. i'm a med student. i had seen a patient whoes cranium was not put back. his left fronto-temporal lobe was removed. how dangerous can it be? On New Years day09 our day began with me fighting a headache. As headaches had been happening for 4 months following a accident, my husband coaxed me into lying down and I took some motrin(the militsry's cure all! )We had plans for dinner at my in laws house for a good old fationed southern meal.. hog jowls and black eyed peas. Being born and raised in Chicago speaking not only English but also French and polish(traveling to many places)I have tried many different foods but never hog jowls or black eyed peas. I was excited. However the headache grew worse and worse. My husband told me we needed to go to the hospital. I refused saying give me more motrin.. it will go away(it always had)Before long the pain was so intense I screamed in pain and started seizing. My husband called 911 even though I begged him not to. The EMS refused to take me telling my husband that I had a migraine and did not need to go to the er. I was seizing and fading in and out of conciousness. My husband demanded they transport me. I was diagnosed with a meningioma the size of a golf ball on the right frontal lobe. The swelling from the tumor caused such severe swelling, my brain had completely shifted.Seurgeon stated had my husband not insisted EMS transport me, I would have died that night. My soulmate saved my life. Craniotomy removed the tumor but problems exhist. Had 2 more crani's last month with grid probe seizure monitoring. 2 crani's in one week. The hydrocephulus I have had in the ventricle drained durning surgery(exact dr. words were spurted out)The surgeries were supposed to fix the fluid, severe headaches, memory loss, vision and seizures. Did not. just shy of 2 weeks post op, the fluid and swelling were back with an attitude. There are alot of resources for folks like us. Try THE AMERICAN BRAIN TUMOR ASSOCIATION and if u type in headache after brain tumor removal in your search engine alot of good resources comes up. Good luck to you all. i HAD THE SURGERY ON MAY 7TH 20011 AND AFTERWARDS HAVE DIZZINESS AND CAN'T DO ANYTHING AROUND THE HOUSE DUE TO HOLDING ON TO THINGS. I HAD SURGERY FOR REMOVAL OF A MENINGIOMA ON LEFT SIDE OF MY BRAIN. I had a menigioma tumor in the right side of my head removed a year ago and still have pain in my head all the time. Is this normal? They want me to take anti-depressants for the pain and I don't think I should. Is this normal for a doctor to want this? I got an infection in my skull two months after my surgery. Did the doctor do something wrong and could this have caused me any permanent damage? I had a DNET removed from left temporal lobe and it is nearly 8weeks recovery now and I'm getting hit with fatigue more on a mental side. I'm 33 years old and suffered from simple/complex partial seizures. I'm very active in a gym and at running sports and have always been mobile. My recovery period seems to be good when in the gym and I'm on a steady slow build up on activities. But I haven't started running yet and I'm waiting until oct to see neuro surgeon to get a pass to play soccer again. I'm suffering from a tiredness when I've had to concentrate and I'm constantly having rests but my sleep pattern at night is difficult to take as it seems to get past midnight before I can even try to shut down and sleep. I had a craniotomy in April 2008 due to a subdural hemorrhage caused by a bacterial infection(which ate my heart valve, as well. I was in the hospital for 6 desk, transferred to cognitive rehab for another 4 weeks then transferred town activities of daily living rehab for 3 weeks. I left the rehab an epileptic and experienced nausea and dizziness for 2 years after the surgery. i am on seizure meds, A-fib drugs, synthroid and coumadin. i have my faculties, although deemed disabled. i now strength train again, but due to heart limitations, have not returned to running. I do hike without difficulty. My most serious continuing problem is depression caused by PTSD. I am lucky to live, as I have two young sons 5& 7 you. Their mother divorced me mid health crisis, but I have been remarried since 2010 to a wonderful supportive wife and step-mother. Life is so short and one doesn't realize it until you have a near-death experience. Good luck to all of you. May you have long and happy lives! who is the author of this article and when did you write it (year)?? i was operated frontal craniotomy on 13thmay2011.rechecked by neuro onkology doctors at mumbai on 2nd september 2011 with two mri reports;contrastand another one. it was found that ihad peripherial oedima with all other conditions as normal.please advice me about rest,movements and physiotherapy. Had a craniotomy to remove a colloid cyst in 2002 every thing went well with the surgery but 9 years later still having haedaches and mirgranes daily been told they are a side affect of surgery, recently been diagnosed with spinnocerebellar whats wrong with my brain. My uncle is presently confined in a private hospital due to severe cardiovascular disease(stroke). he undergone craniotomy last nov. 14 and the doctor said that the operation was successful but as i observed he talked like a child and he experienced hallucinations,is it ok? I see a lot of comments about craniotomies and not a lot of answers. The only story I have is my own. I had an accident (falling off a golf cart a co-workers was driving too fast) onto the concrete. I had an epidural hematoma and hence the craniotomy. Nausea did occur for me for about 4 weeks. Every time my mother would assist me in sitting up in bed, I would fall over and she assisted me in walking to the bathroom. I heard nauseau is common due to the fact that one side of your brain was operated on, so it messed with your equalibrium. Mine went away after a month. Perhaps persistent nauseau is from a medication? I had my surgery September of 2007. To this day, I can still have some pain on the side of the fall/surgery where there is a dent (my hair hides this) and I can feel little bone spurs or something like that. The pain isn't tremendous but continues 4 years later. If I sleep too long on that side of my head, it will start to hurt. The neurologists try to tell me it's scar tissue which I find it hard to believe after 4 years. The truth of the matter is that many neurologists don't know the answers to questions. They'll tell you the brain is the most complex organ in the body...true. Right now, I've had a movement disorder come back (they still don't know what to call it...perhaps myoclonus but they're not sure) after being free from it on medicine for 3 years. It has gotten worse. Watch out for Klonopin. It can help people, but it's also a benzo (like alcohol) and your body gets addicted to it as it is stored in your fat cells. If a doctor doesn't wean you off properly (i.e., in a very slow methodical way), you end up detoxing which is awful. I don't know that anyone can "come back" completely from a craniotomy--it's serious brain surgery. All I can say is like one person said on this post is that we have to grateful to be alive. Keep pushing your doctors or find one that thinks outside the box and can give you answers or at least mitigate your symptoms. Good luck to all and Happy Holidays. my son he is 3years old he had a brain surgery 6weeks ago (right frontal lobe) he had seizure reason is right frontal lobe mulformation. now seizure has controlled but his head swelling is there. but the doctors are saying is normal but i am not happy with them. please help me with this what make the swelling around the wound? it is looks like full of fluid. My brother, 16 years old, recently had a surgery. He got beat up at school, and a fragment of his skull was pressing on his occipital and pariental lobes. The surgery was successful, but later that day, he was told he had a blood clot, in which they removed. The next day followed the same and he hemorrhaged. He's recovering from it and I just wanted to say thanks for providing the information to help me understand whats going on. Thank you so much, and I'm so sorry for those of you, who have loved ones who have not recovered as miraculously as Jeremy did. I wish the best for you all. Hi, I had a craniotomy done 4 months ago to remove the cyst. It was so bad because I had a risk I could die. I am grateful that I have this done on time. I am still having nausea vomitting sometime I got dihedreated easily. I can't drive a car because I have fobia and I am so scared to go by the wheels. Is this normal. I had my school open completely my hairs was shaved. I am doing better bus still not the same it drives me crazy I want to come back to real life. Is this cyst come back is anyone know? thanks! I just had a craniotomy on Feb 27 to remove a large brain tumour. I had a grand mal seizure January 31st and 1 month later had surgery. My surgery went well with 99% of tumour removed. My post craniotomy headaches while in hospital was the worst pain I have ever gone through and no pain meds would help. After 1 week in hospital I was discharged and thank god the headaches are better. My headache is worst in the morning after sleeping. My temple area, where there was an incision, is still quite swollen and my surgeon said will take 1 or 2 months to go away. I am thankful for the care I have received and am happy to be on the road to recovery. a reletive of mine operated for meningioma (grade1/111)approx 1cm near carotid artery,said to be infilterating nerve roots and removed completly,1 month back.but there is swelling on one side of face seems increasing and numbness on half of face on side of operation.how long this swelling will last ,what is the reason?she had symptoms that is loss of vision in left eye for 6 month befor operation .how much is the chance that her vision retuns.she is in her early forties.tumour was removed in pieces. the doctor was operated arachnoid cyst in lt temporal fossa in my head on aug2010.and now the probelum in head (ct correlation).skull bone are vibrating now too.but doctor says you take openion with the department of plastic surgery.please doctors help me what could i do for repair vibration of my skull bone.i am not happy with my operation.because my face is looking very bad cause of swelling in left side. Hi my story is good but very sad. My lovely partner for almost 10 years suffered 2 ruptured brain aneurysms on the 17th of December 2011 and has undergone 2 open brain operations in 3 and a half months, when I got her to hospital I was told the best outcome I could hope for was the she would be paralysed down the right hand side and have no speech. I spent 8 to 10 hrs a day at the hospital with her for nearly 5 weeks , taking her for her first walk, stimulating her brain and re habilitating her because all the hospital would do is spend about 5 minutes a day with her. I spent that much time there that the re hab registra and the neuro sergeon both called me to thank me for all the time and effort I put in to my partner Linda. She had made a remarkable recovery and was walking and talking normal although her memory was a little cloudy still but over time was getting back to normal. However during her initial scans the doctors found a 3rd aneurysm of 8mm on the opposite side of the brain and that when she was well enough that she would have to go back in and have that clipped. She recovered so well after her first operation that she was well enough to have the second operation at the end of March 2012, she had a nine hour operation which went very well and an hour after the operation she was talking and joking with me for about an hour or so in ICU. She was released 5 days later from hospital and was great, the staples had just been removed and we had to wait a further 5 days for the stitches to be removed by her local GP. And this is where the sad part comes in. The day her stitches were removed her whole personality changed and she did not want to know me anymore, all she did was get angry at me and wanted me out of her life, for some reason her mind kept telling her that I was a liar a cheat and that I was never at the hospital for her etc etc and because we didn't live together, although I stayed at her place after the first operation for around 3 months so I could cook for her clean for her and look after her cat and her son who is nearly blind, I ran myself to the ground for her and her family and now I have nothing to show for giving her so much love and care and for being the only one that was there for her though this horrible time she went through, she will not take my calls and when she does she is just nasty and screams at me. She now is moving this week far away down the south coast and there is nothing I can do to stop it or be there for her if something goes wrong. The son that lives with her is so stupid that he just goes along with whatever she says so now he hates me even after all I did for him whilst she was in hospital and the same goes for her mother that Linda was not talking to at all , but now she has come on the scene and she has been controlling Linda and she is the reason the love of my life is moving because her mum has talked her into moving down where she lives. This all seems so cruel and unfair because the son and her mother are making her do things that Linda would not normally be doing, we were best mates and so much in love that all day and night I just feel numb and the reality of this still has not sunk in. I had an emergency craniotomy in Feb. 2011. I didn't know what was happening. Then spent 2 months in a rehab. nursing home, was unable to know how to walk, but knew people, but didn't know how to do anything like getting dressed or that I was supposed to comb my hair, brush my teeth or use a phone to call my family. I received great therapy and returned home able to cope. Except for the headaches, which are really still very hard to bear and a slight loss of hearing. Now the doctor recommended "vestibular therapy". That is retraining the brain. This could take up to a year and a half to help and very expensive. I am a sr. citizen. I guess it will never get better, but I am living with these conditions because of my family and friends helpfulness. I'm glad I'm alive. Good luck. I underwent a craniotomy approximately 3 weeks ago and am doing extremely well. After the surgery I was in ICU for one day, in a regular room for one day, and the next day I went home. My recovery is due mainly to the fact I have a terrific support system at home. It is my opinion that the surgeon was instrumental in my recovery. My thoughts and prayers go out to all who may need a procedure of this type. I hope you all have a surgeon as capable as the one Ihad. Looking forward to getting back to work. I'm 63 yrs old, had aortic valve replacement 2 1/2 yrs ago. At time of that procedure neurologist aware of my aneurisim condition but approved heart surgery prior to crainotomy. Now, 2 1/2 yrs later, aneurisim has grown slightly and surgery now being scheduled. Husband, children & grandchildren encouraging me to go forward with surgery. Each day is torture - do I or don't it!!! My current age and average life expectancy - seems I should go forth. Should I expect headaches, nausea & fatique? how much blood clots in the brain can a patient for a surgeon to decide to do craniotomy? in craniotomy surgery removal of bone flap,that flop keepit in the patients abdominal area till his recovery(6months) why they keepit in theare? HI my son had a craniotomy to stop a broken blood vessel and to have a extradural heamatoma removed. He is autistic and it is very difficult to know how he is feeling because he has limited communication. We became really well again (almost like nothing had happened) about 3 weeks after the op for about a month and then he returned to not being happy, no communication at all and sleeping a lot. This lasted for a week and then he was happy and communicative again - with not day sleeps at all. He was well again for 2 weeks and again unwell for a week - and this has happened again just now. Does anyone have a similar experience ie well and then relapses for a week after a period of time? Would love to know how our son is feeling and if he is in pain (pain killers don't seems to help). Great article, very interesting and clear. Post craniotomy chronic pain is a major issue, and I do think recovery is longer than 8 weeks. Many doctors say anywhere between 6 months to a year. Also, could you please list refractory epilepsy in your list of what a craniotomy is performed for? Such a procedure is common as well. As a followup to my earlier post, it has been 5 years and 1 month since my craniotomy. I have acquired seizure disorder due to the TBI and subsequent surgery. I believe that I am in good health and others see me as unchanged since before my operation. I have been depressed almost continuously since 2008. I had 3 1/2 years of talk therapy due to a plethora of traumatic events in 2008. Briefly, Father died, I was terminated from my job, had bacterial endocarditis(twice) and surgery to replace aortic heart valve, craniotomy, wife filed for divorce. I was declared disabled by Social Security for cognitive dysfunction and PTSD. I stopped therapy and was recommended medication by my neurologist, but refuse to take drugs that can have side effects that are worse then the depression itself. I exercise to manage depression. It is not at the depression level to think of suicide, but at the level that I have no fear of death and welcome it, if a natural death. My therapy has been my new wife who I met in the winter of 2008 and married in 2010. I also have two lovely boys, aged 6 & 8, who give meaning to life beyond myself. I am scheduled for a craniotomy on June 28,2013. I have 2 aneurisim in back of my eye and one behind my other eye. The doctor will go in and clip all 3. I would like to know what I can expect from this surgery? How difficult is this and what side effects can occur? Has anyone had this procedure done, what was there progress for recovery? On June 14th 2013 my Partner had a very large tumor removed. The blood supply was cut off to the tumor 2 days before the removal to help the bleeding while in surgery. It took 6.5 hours and they got most of the tumor. A small amount was left as it was not worth the risk of Removal. No cancer ! The tumor was on the back right side. She has a upside down horse show looking scar . It took 35 staples to close her up and the did have to remove part of her skull as the tumor was growing into it. I was scared BUT we both stayed clam . She was in CCU for a day and the to the Nero floor for a day. They had her up and walking on day one and she did stairs on day 2. On day three she was told she go home as soon as she had a bowel movement. This was the hardest thing the first 3 days due to pain meds ect, she was home on day 3 ! . 10 days after her staples came out and she was cleared to fly home to a family reunion. she tires a bit still and has some off and on swelling . She is still on her anti seizure meds and will be for awhile i am sure. May have to always take them. We had wonderful doctors and are so very grateful the tumor was found. She has little head pain much less than before she had the tumor removed. She is 54 years old and plans to go teaching this fall. I am writing this on July 12th so one month later . Only thing that is not 100% is her vision but that is coming back and had beed effect by the tumor . I think staying clam helped us a bunch . In 1987, in a 14 hour operation, I had a gigantic brain A.V.M. removed at University Hospital. The day before, I was wide awake for a pre-operative embolization procedure that involved the removal of my skullcap to allow the neurosurgical staff to fill in as much of the vessels in the "dead' parts of my brain with latex as was possible, to lessen bleeding. The formation of the A.V.M. had caused one full hemisphere to die, directly after my fetal brain's formation. However, the surgeon who performed my craniotomy reported, midway through the operation, that the scans that I had had before my final stroke (CAT Scans) didn't show the essential intricacies of my vascular problem. Apparently, the whole operation was anticipated to take only 3 to 4 hours. Anyway, I made I through, finished high school, took a bachelor's degree in writing and took a master's degree in writing education. I worked my way through grad school as a writing tutor and was able to use voice recognition software to diminish my memory deficit, substantially. On August 29th my 21 year old son was involved in an accidental shooting with a .45 handgun and was shot through the right temporal area with the bullet exiting just over the end of his left eyebrow. He underwent a craniotomy on September 5th to drop his ICP numbers, which worked. He is a miracle, #1 that he survived the initial incident, and surgery to reconstruct the bones in his face and #2 that he is talking and up walking with some assistance as he is currently blind and most likely will remain blind as a result of the accident. We’ve hit a brick wall and have tried all sorts of avenues to no avail, so I thought maybe one of you has had this experience. Any help or suggestions would be GREATLY appreciated. Had a brain infection removed from right frontal lobe at age 20. Zero drug use. Minimal drinking. Great dental care. NO known cause. Surgery went well, but I still have not gotten my life back at age 25. Seizures every 6 months. Doesn't seem that bad, but it's ALWAYS a week or so before I can legally drive again. They are always severe. Multiple requiring hospitalization. One time I had three 5+ minute ones in a row. Then 200+ tiny seizures during a week hospitalization. Had no memory of a month before. Woke up at Mass General Boston not knowing where I was. This was about 1.5 years ago. I live a happy life. Luckily I come from a wealthy family. I can take my time with school. I thank God for that every day. Doctor's won't really comment on possible future risks from all of these seizures/hitting head from seizures/brain damage from surgery. My memory is already pretty bad from all the trauma, but I'm worried I could develop another brain related condition later in life. Mostly from the constant abuse my brain takes. I'm on 300mg Lamictal BID since episode 1.5 years ago. Seizures are smaller now, but still every 6 months. Very optimistic about the seizures, but not on moving forward in life. Amazing gf of 4 years that has been through almost all of it, but I don't want to be stuck at age 20, when I had the surgery, forever. A quick story about my wife's craniotomy. Six years ago, a golf ball sized, benign hemangioblastoma was found at the base of her brain. The surgery was successful, but the recovery did have some set backs. Fluid build-up required a drain to be inserted in the top of her head. She suffered a small stroke in the "silent" part of her brain that supposedly would not show any effects. With all of this, heavy medication, especially steroids, were administered. She was good enough with memory and physical task within weeks, but it took at least six months for her "real" personality to return. The bad news was nausea and vomitting. She struggled with this for over two years. Doctors ran all kinds of tests and tried all kinds of medications - the vomitting continued. It was only after a few comments from others that the gall bladder was suspected again. She had had a hida scan three months after surgery, but at that time, the gall bladder was not found to be that bad. The gall bladder was finally removed and she has not vomitted since that day! The lesson that I learned was to stay after your problems. Go back and revisit areas that have been dismissed in the past. The other lesson that I learned is that all craniotomies present themselves differently. My wife's outcome was ultimately excellent. My prayers go out to you that may have continued struggles. for a while I was suffering from bad head aces and was admitted to A and E and stayed over night and was sent home nothing wrong with you! about a month later I had a tonic clonic seizure,[one 4cm wide which caused a tonic clonic seizure.] I was taken by ambulance to A and E on a Saturday morning and A and E sent me home. I went straight my GP on Monday who got me a M.R.I which showed 3 meningioma tumers all three need to be romoved within this year, if they are not there will be seriouse problems, they can not be removed all at the same time so 7 weeks between each one starting 28th January 2014. Thank GOD for my G.P and boo to A and E in Jersey Channel Islands. FIGHT for the correct digonosis and information. I HAD A CRAINIOTOMY IN 2012 AND HAVE NOT REGAINED MY APPETITE. STRUGGLING TO STAY AROUND EIGHTY POUNDS, AM FATIGUED ALL THE TIME, IRRITATED MOST OF THE TIME. ANYONE HAVE AN ANSWER TO DESIRE FOOD AGAIN AND HOW DO YOU DO IT? my son is 15yrs old he had surgery back in april had a craniotomy.he has a couple calcium deposits they removed the biggest one he had.just wondering if anyone knows any type of long term side effects to look for. My wife had a craniotomy in the late 80's as a result of epidural hematoma. she currently ha fronto temporal encephalomalacia. does everyone get encephalomalacia after a craniotomy? I had a grandmall seizure I had an awake craniotomy on April 9th of last year, to remove a large benine tumor. Neuroglial tumor in the left temporal occipital lobe oligodendra astrocytoma. I had to have speech therapy cuz of memory problems but I still have head aches although I am doing so well and my memory is a lot better. I have a shunt pipe since my brain tumer surgery in 1995 while was of 2yr.Now i'm of 21.Is the shunt need to be removed or not? My husband had a craniotomy of the right frontal lobe to remove an abscess 8 months ago and he is still not right mentally. He appears to be depressed, confused and sometimes in a fog. The mornings and early afternoons are the worst times for him. How long does it take to recover? Does anyone experience these same symptoms? Sherry - I had a large benign brain tumor removed 2 months ago, so I am still under recovery treatment. My surgeon sent me to a Neuropsychologist since I was concerned about some memory issues. The surgeon told me that it is more difficult to get full mental abilities back if the patient is over 40 years old. I was very happy being sent to the Neuropsychologist to be evaluated as this would be the best person to evaluate/help me after this major surgery. If your husband has not been evaluated by a Neuropsycologist, this may be a good thing to ask for a referral to be evaluated. I was tested (have not yet gotten test results back), which will show the Neuropsychologist if there are any cognitive issues. If you tell them exactly what are the concerns (I would keep a daily journal), they may be able to determine what is happening and give help. Everyone is different and I have done a lot of reading on this procedure since I went to the ER, where the tumor was found, and had it removed 2 days later. I did not have much time to even think about what was happening or know what to expect. I have read that we are all different and results will be individual, but this recovery time can be 6 months to a year or longer. I hope he starts feeling better soon! 1 and 1/2 yrs back, I underwent right side craniotomy surgery and now i'm alright but still i want to know, wat should bot i do in my life time bcoz of this surgery. The things which i do may create a big prob. My brother underwent a brain surgery for AVM 2 years back and his right side was paralyzed and coulnt speak. Also the side view of right vision is lost.After giving continous Physio and Speech theraphy he improved much better that he could do 80% of his job on his own.Now he walks without support but his hand is not fully functional.He can lift his arms to a certain level but with strain. He has not gained movement in fingers.Also he is unable to give instant response orally. It is not that he couldn't speak.He sings songs along with TV. But he finds difficult responding orally. Will he be recovered completely..back to normal. How long will it take to recover? Has anyone had a cranitonmy for cavernous malformations? May have to get one and I'm just wondering what my options are considering one of the few lesions that hemoraged is in my brainstem. I am a 47 yr.old female. I had a cranitonmy two yrs ago. I was doing fine until 6 months ago. I have servere headaches, dizziness and Im tired all the time. I was diginosed with Moya-Moya Disease two and a half years ago. That is the reason why I had the surgery.Would anyone thats has Moya-Moya please contact me at dana_janos@yahoo.com so we can talk further. it is very rare and I would like to talk to someone that understands what Im going through. My grandfather was recently thrown from a horse and landed on his head into concrete. He had a double craniectomy where the removed both bone flaps left and right and then they put back one side. He has yet to open his eyes, (this is written on the 6th day of hospital stay after lifeflight), but they brought him out of the medically induced coma,and he is now breathing with only the assistance of a ventilator and they are prepping him for a trache operation. He hasn't spoken or anything just moving and crossing his legs and making the motions as if to pull himself up out of bed. Does anyone know of anyone who has gone through something like this a traumatic brain injury and what I can expect as of his recovery? Please help me and my family. My email is alitbabyy.am@gmail.com he is 57 years old, diabetic (just found out) slightly overweight, has rheumatoid arthritis but is extremely active and very strong. I had a meniginoma which was the size of an orange removed in 2010.I also had craniotomy and my operation was 10 hours.I did not know that I had a brain tumour until I woke up!I need very little sleep and most of the time I have unbelievable energy.Since my operation I have been unable to cry as my emotions are now very euphoric.My concentration is limited so I do not drive very far.I also have not read a book for 5 years,yet before operation could read 4 books a week !I still get peculiar sensations in the area I was operated on.This week I flew to and from Jersey and it has caused me to have an awful headache.Anyone else had similar? I woke up talking to my mom, sis, docs, nurses, after coming out of surgery from a meningioma in the right frontal lobe on April 6, 2015, at 48 years old. I was released on April 8, 2015 because I did not need rehab and felt fine. However, I returned to my doctor's office because my face was distorted, my sister said I looked like an Avatar, I had to agree because although we can joke and talk to one another like that, I was trying to figure out what I looked like until she hit the nail right on the head. My doc explained that it was only 2 weeks after surgery and I would have to give it some time. He also said, I look fine and it's going to be a journey for my healing process. I went driving after 3 weeks to 3 doc appts because I was told I could drive after 3 weeks. I also went window shopping until it felt as if my head was going to explode. I immediately left the store because I felt if I didn't, an ambulance would have to be called. I drove myself home, 5 mins away, parked car and took 2 oxycodone's, to no avail. I got up the next day and was ferociously thrown back onto the bed because the whole world was spinning in my room, I screamed so loud, my sister came running into my room. I was scared, everywhere I turned made me dizzy, even with my eyes closed. I prayed to God and the dizziness went away that evening, my face is restored but I get: pains in my head as if someone is stabbing me in different sections of my brain with an icepick, dizziness at times, a wet drippy sensation around head as if someone put a soaking wet knit hat or bandana around my head, grasping at the top of my head as if someone is trying to lift my brain out of my head-softly, electrocution shocks, rattlesnake sounds in my brain in the morning while lying in bed when hungry or whenever I'm hungry and lying down, as if a flat balloon is being blown up and then deflating, pressure in right ear, major itching and scratching in the top of my head and headaches at times. If I'm outside, the light can bother me if I don't have shades on, the computer and reading sends off the electric shocks in my brain as well as scrolling on phone or laptop. I know cell phones cause cancer and brain tumors, talking on the phone bothers my brain, I found my ear piece that goes around my neck and able to talk on cell now, I resorted solely to my home phone. If I'm stressed the pain increases 3x or more, therefore, I have to remember to calm down, quote scriptures, pray, etc...but I have to admit it's scary. I went back to my doc on July 21, 2015, explaining all of the above symptoms and he said I should not be having any pain at all or experiencing any of the above. Therefore, he prescribed an MRI w & w/o contrast. He hasn't called me yet, but I have the cd that won't come up on my laptop and the results which read a small area of cystic encephalomalacia, really not trying to stress out. God is still good considering. My son 14 years old had a crainatomy on right frontal lobe,after a boy in class done a stunt on him from learning it off the Internet.His skull fractured in 3 and blood cloths as well as some blood in brain as well.thank to Allah our creator he saved my son and his normal.its now a month after the operation.he had an excellent surgeon who also brought to our attention that ct scans don't always show u everything.before the op he tested my son's body reaction, etc and realised there was something more severely wrong than what the scan showed.the op was bigger than expected as when he opened up he saw 3 fractures which didn't pick up even after 2scans.he has plates and screws and before the op suffering from dizziness and pain,how has all gone.doc explained this was caused by pressure on the left from the right side swelling. He seemed to have got all that out that was causing the pain and dizziness. Just had a crainiotomy exactly a week ago. Best Doctor in the world for tumor resection is Dr. Maryam Rahman at Shands hospital in Gainesville, Florida. I'm 27 and barely look like I had surgery. Yes I have headaches and hear liquid in my head but I chop these up to having just had major surgery. I wish I could attach my before and after MRI so you can see what an amazing job she did. Truely remarkable. If you have to go through this, pick a great doctor that you really like as a person because they are going to be cutting into your head. I was pretty nervous about the awake part but had nothing to be worried about. She has a great team and all the doctors there work together which takes a ton of stress off of a neurosurgery patient. Hi, My husband 30years old had a craniotomy last July 2015, After the surgery from a 5cm gemistocytic astrocytoma at his right temporal lobe he still need to undergo to radiotherapy for 30sessions since the tumor wasn't totally removed yet. His radiation was scheduled by next month december 2015, But right now he is suffering again to a constant extreme headache. He is taking now Dexamethasone 4mg once a day and it makes him feel better. Has anyone else experienced this headache again after surgery?. My husband is too young , our marriage had just started living a happy life with our 9months old baby. Godbless you all. Hi,my name is Joanna, I am 38 years old and I had a craniotomy done in June 2007. I had a tumor at cerebellum which at some point had bled. First 3 years after surgery were fine. Then horrible headaches , pain, nausea. I have had nerve blocks done and when those didn't work I had my greater occipital nerve on left side of head removed in 2012. Still I experience headaches on a regular basis of no less than 4 times a week. I have tried anti seizure medications, high blood pressure medications, for the headaches. I have spells of disorientation, confusion, vision problems, slurred speech, poor circulation in hands and feet. Has anyone else experienced any of this? I feel like I am going crazy. I had a bifrontal craniotomy for 12x17mm meningioma back in 2007. Since the last 9 years, I have experience different sensations, they are hard to explain. When I have tried to talk w/doctor, he says b grateful to b able to walk and talk, which I am. But, on my bad days these "spells" I have are scary, because I don't know if its my brain or some other health issue. I have taken a norco,(not because of pain) but it makes my brain switch to another mode, which makes me feel better. So, once again, don't know what is going on there. Your brain is a powerful thing and not sure if it is from surgery or just me. I do experience memory loss, people do have to remind me of things we done or was told to me. This is hard for me to write, very frustrated, because like some of you, not trying to sue a doctor, just want to know if others experience some of the same things. The doctor prescribes anti-depressants, and so on, I take a weak one, don't like how the stronger ones make me feel...nothing. Applied for disability, because of my "spells" I'm scared that I would b a bad employee, worked at a shop for 15yrs. and missed a lot of work because of all this. I just wake up with it, sometimes it wakes me up. Heart racing, BP high, pressure in chest, all the signs of anxiety, but didn't have before surgery. I'm 60 yrs old, and don't know what else to do. Just want to know, why. And if it's a normal thing in some cases. Someone literally messing with your brain, has to have some side effects. Thanks for reading, and if anyone else feels similar, please let me know. My dad had a craniotomy on June 22, 2016. Since his operation he has not been wide awake. He would open his eyes once in a while and would go back to sleep. Is has been more than a month and a half already. is this normal? Can any tell me. I had a Craniotomy when I was eleven years old after receiving massive head trauma in a car accident. I did experience fatigue for eight weeks and from there I did not have any real problems. I did start with Epileptic Seizures when I was 48, three Gran mals but that was 8 years ago. I have been on medication and have not had any problems since. I was fortunate to have an excellent Doctor and he explained everything to me. Hi my name is Madlen had a left frontal lobe craniotomy on the 26th April 2006, I felt that the surgery l done helped me with my communication , l just had to adjust to a few different lifestyle changes that have relished assisted me for the better.l just came to realise communication is one of our most vital important ways of conversation with others both immediate & social if it's not easy. As they say: "less is more"... & "You got nothing nice to say best you say nothing at all"
All l can quote is life is what you make it cause you don't know what you got until it's suddenly disappeared forever!! I had a craniotomy in April 1982. I was six years old and has was pushed off a bus, resulting in a subdural hematoma about the size of a baseball. My surgery was so long ago and I was so young, I have questions but not sure who could answer them. I've had daily headaches for 34 years and now am having issues with sinuses on right side that are getting progressively worse. Dr said it is connected to the injury and surgery. Anyone else experienced issues long term? my daughter had a operation on the 01/03/17 (craniotomy) to remove a tumour at about 1300hrs which lasted until 1800hrs, then put into recovery for the evening til next day. Hi Everyone, I am so happy I read the above experiences. They are very informative. I had a craniotomy on 21st April 2017 to remove a 4 cm meningioma. I was in hospital up to 1st of May 2017 but I left the hospital being unable to walk on my own because there has been some bleeding from the area of operation to the lower part if the brain so I had lost balance. But with the help of physiotherapist, its been 5 weeks since surgery and I am able to walk on my own. Progress is there, slowly but surely getting back to my old self. Even though I still have those headaches and easily forgets things but I am happy with my progress. My advice to everyone is patience, take it slow, have lots and lots of rest. Also have a positive mind, don't think negatively and don't entertain any negative views. PRAYER ALSO HELPED ME AND CONTINUES TO HELP ME A LOT.Good luck to you all. I had a craniotomy on June 5th for a benign tumor on my right side around the optical region. I have fully recovered and am back to leading the same life as pre-operation. I am sorry that so many of you are struggling with post surgery challenges. Yet we are all alive to face another day. God bless each of you. Prayers for your healing and comfort. Have any of you decided to live without replacing a bone flap? If so, do you live a normal life and were there complications to not having the bone covering your brain? Do you wear a helmet or just live normally? My brother needs to have something put in to replace the flap of skull that was ruined due to a massive MRSA infection, but I am reluctant to put him through any more when he is doing great without it. I fear another infection. He is disabled due to a head injury and doesn't go many places anyway. 52 years old. What to do... We will need to decide soon. Today, out of curiosity, I decided to check out Cranial Surgery and Flaps. Sometime between 9 and 11 months of age in 1955, I underwent surgery for, what I had explained to me as "brain tumors" on both sides of my head. Later, my Mother used the term Bone Flaps to describe the Horseshoe like scars on both sides of my head as evidence of the operations. My Mother has passed sometime ago, and for what ever reason, when I was younger, I just wasn't too curious as to the actual procedure, or to how significant my complete recovery was. As you can deduce, I'm into my sixties, and with the exception of some rare migraines, and scars that preclude my "shaving my head", I have had no physical issues relating to those surgeries. Reading the preceding comments, I just wanted to lend an optimistic note, for those who have this surgery in front of them. My brother is suffering from this condition after brain surgery he is sleeping too much and cant walk properly he need support to go any where is that normal or not ?